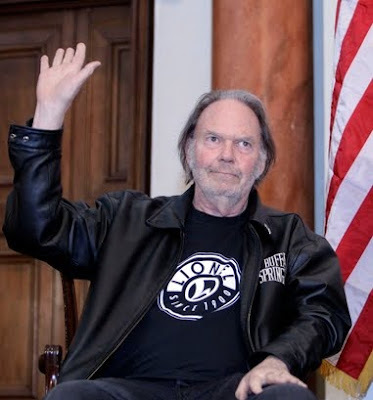 (AP) - Canadian singer-songwriter Neil Young acknowledges guests before speaking during a U.S.-Japan friendship event at U.S. ambassador's residence in Tokyo, Wednesday, Dec. 14, 2011. Neil Young is in Japan right now. Today he attended as a guest speaker at Cloudforce 2011 Japan. Also he joined will.i.am of Black Eyed Peas and others to announce his support for 'Tomodachi' project to help recovery efforts in disaster-stricken Tohoku region at US ambassador's residence. I noticed the Lionel shirt, I wonder what's his current involvement with the company?! I wonder, too, how many duplicate Neil Young LPs Susan & John had when they were dating at Stanford. I bet they both had copies of "After the Goldrush" but did they rush out and get "On the Beach" when it hit the record shops? 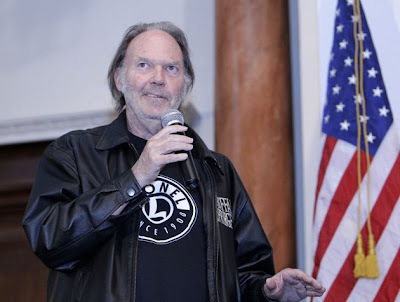 Neil Young is CO-OWNER of Lionel Trains. Neil only wears brand clothes of his own gigs. Do you know a vocoder does? Are you okay there fellah? Do you know what a vocoder does? Hello MNOTR - yes I'm well aware of what a vocoder does and Neil's use of it in the past. You completely missed my point, however, with your condescending question and multiple posts. That's ok; I realize that you have become the new 'doc' of Thrasher's blog...Merry Christmas! Whoah, Jonathan, back up here. What is your point? My point was that an auto-tune is very much an vocal effect the same as a "vocoder." What's the big deal? And that's some pretty heavy duty drama to lay on me, man. My point was, and still is, that I don't consider will.i.am.whatever to be much of a musician - especially when standing next to Neil. In my opinion, Autotune has contributed greatly to the plethora of garbage that passes for music these days - mostly on the so called pop charts. There is no big deal - it was just a comment and I referenced the very beginning of 'Song X' from 'Mirrorball' to back up my opinion. Apologies for the "heavy duty drama"...Merry Christmas to you and yours!! If you ever watched "Joan of Arcadia" it was pointed out that one will.i.am was in a role playing God. Honestly, I think it would be cool to experiment with an auto-tune. For someone like Neil who sort of starts out between octaves, I wonder what the output would be. ha ha..... Happy new year Johnathan! you've certainly insulted MNOTR, calling her the new doc! BTW Johnathan, I haven't been on the 'wheat' for quite a while and my comments are quite "inane" anyway.